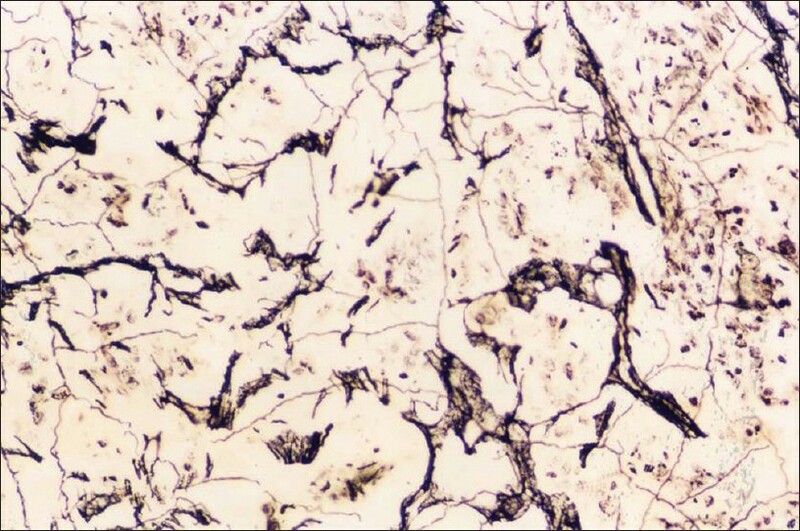 Reticular fibre is the type of connective tissue composed of type III collagen secreted by reticular cells. 1. Creation of submicroscopic sensitized sites of silver introduced in reticular fibres. 2. Uptake of considerable amounts of silver by tissues in reduced form. On treatment with reducing agent, silver taken up by tissues is converted into metallic silver which is deposited and appears dark brown or black deposits on sensitized sites. For permanent preparation, gold chloride is used. The solution will become turbid. Add ammonia drop by drop with constant shaking untill the turbidity dissappears. Make final volume 40ml by adding distilled water. Oxidize with 0.5% KMnO4 for 2 minutes. Bleach with 0.5% oxalic acid solution to colorless stage for 1-2 minutes. Treat with 4% Ferric chloride for 2 minutes. Place slides in couplin jar containing ammonical silver nitrate solution for 1-5 minutes. Rinse in distilled water for 20 seconds. Treat with 20% formalin for 1-3 minutes. Wash in tap water for 3 minutes. Treat with 0.2% Gold chloride solution for 10 minutes. Treat with 0.5% sodium thiosulphate for 1-5 minutes. Counterstain as desired (Van Gienson or Eosin is suitable). Dehydrate through increasing concentration of alcohol. Clear in xylene and mount to permanent mounting medium. what is the source of the silver ion?